Sliding track and associated hardware to assemble rail slides to fold bimini's, boat tops and camper top canopy's to lay down and slide out of the way for better access. 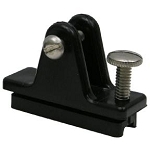 Hardware and fittings for the assembly or replacement of broken or missing hardware on a bimini top sliding track system. Pre-assembled bimini top sliding track kit with either stainless steel or nylon hardware and various deck mount options enabling a boat top to slide into a storage position without having to physically removing the canopy.